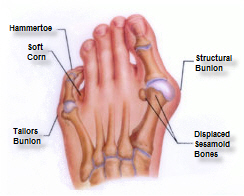 Bunions are often described as a bump at the base of the big toe. With a bunion, the big toe leans towards the second toe, rather than pointing straight ahead. This produces the trademark “bump” which occurs at the side of the first toe joint. Apart from being often hereditary, bunions are often a result of faulty foot mechanics, in particular excess pronation (rolling inwards of feet or mobile ‘flat feet’). Wearing tight fitting footwear that is narrow at the toes may also be a contributing factor. Possible associated problems with bunions include corns, hammer toes, bursitis, tailors bunions, callus formation and arthritis, to name just a few. Padding: Deflective pads placed over the bunion or around the bunion can help reduce pressure. Medication: Occasionally anti-inflammatory medication may help the pain. Orthotic Therapy: Orthoses have been used to help slow the progression of the deformity and reduce pain, but they won’t stop the bunion from developing.